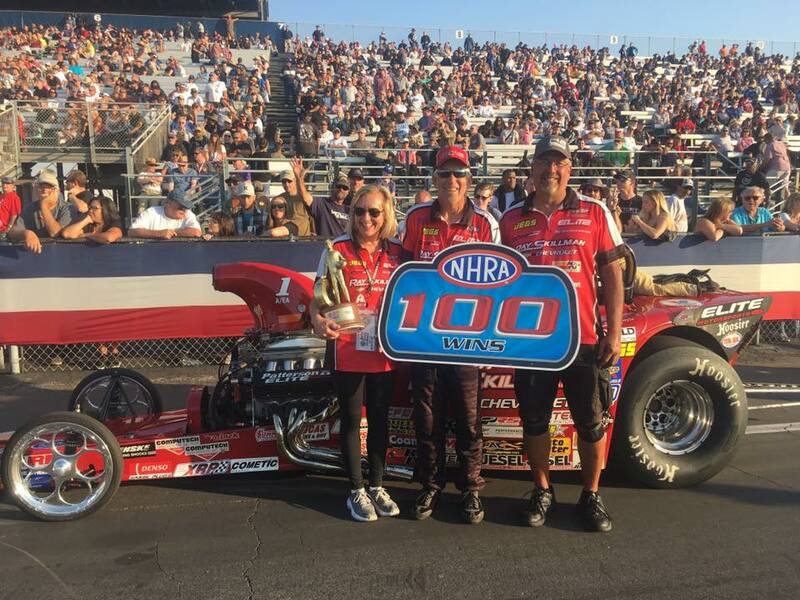 Steve Williams locked up the 2018 NHRA Lucas Oil Drag Racing Series Super Comp World Championship and David Rampy won his 100th NHRA national event this weekend at Auto Club Raceway and the Auto Club NHRA Finals. Williams, Beaumont, Calif., took the points lead last weekend in Las Vegas and held on as Mark Grame continued to go rounds throughout the weekend but feel one round short as Williams began his celebration. Williams’ championship came on a single win in Sonoma, Calif., combined with final round showings in Dallas, Texas, and in Las Vegas for the year. Rampy collected his 100th NHRA National event Wally trophy as he knocked out Doug Lambeck in Comp Eliminator. Rampy drove his famed red ’32 Bantam roadster to an 8.318 mph lap at 112.44 mph for the win. James Stevens and Shane Westerfield took home the wins in Top Alcohol Dragster and Funny Car respectively. Stevens came from the No. 17 alternate qualifying spot to face off with Julie Nataas in the dragster final. Stevens, Gothenburg, Neb., clicked off a 5.281 at 275.17 to out run Nataas, Santa Barbara, Calif., and her 5.402, 271.19 for his first national event win. Defending series funny car champion Shane Westerfield, Anaheim, Calif., took out Ulf Leanders of Sweden in his final round. Westerfield covered the quarter-mile in 5.446, 271.30 to Leanders’ 6.120, 249.72. A pair of series hitters took home the honors in Super Stock and Stock as Steve Wann beat out Gary Emmons in Super Stock and Jeff Taylor out ran Ryan Mangus in Stock. Wann, Modesto, Calif., went 9.782 at 131.39 in his ’62 Sport Fury for his win, and Taylor drove his ’15 Camaro to a lap of 9.267 at 143.51. Chad Webber and Roger Kato rounded out the winner’s list with Webber taking the win in Super Comp over Tony Helms in his first ever national event final round and Kato winning Super Gas over local racer Greg Ventura of Corona, Calif., for his first win in three finals. James Stevens, 5.281, 275.17 def. Julie Nataas, 5.402, 271.19. Shane Westerfield, Chevy Camaro, 5.446, 271.30 def. Ulf Leanders, Camaro, 6.120, 249.72. David Rampy, Bantam Roadster, 8.318, 112.44 def. Doug Lambeck, Pontiac Sunfire, Foul - Red Light. Steve Wann, Plymouth Fury, 9.782, 131.39 def. Gary Emmons, Ford Mustang, 8.780, 156.08. Jeff Taylor, Chevy Camaro, 9.267, 143.51 def. Ryan Mangus, Camaro, Foul - Red Light. Chad Webber, Dragster, 8.916, 164.51 def. Tony Helms, Dragster, 8.942, 176.03. Roger Kato, Chevy Cavalier, 9.945, 174.98 def. Greg Ventura, Chevy Nova, 9.897, 144.03.